Hello all. Hogmany celebrations are finished now. House is cleaned up and everything is ready for exciting new 2015. 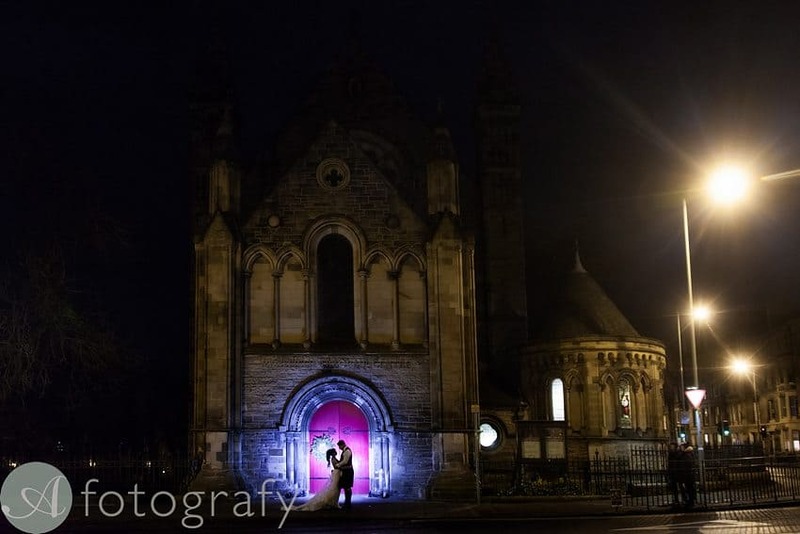 As my this years first story I want to share with you awesome Dragon and Mouse Mansfield Traquair centre wedding! For those who still don’t know who is Mouse and Dragon, go and check it out our pre wedding photography post. The day started real nice. When Tracy brought out her wedding shoes my head went a bit like ^&*&%%$. These were gorgeous Louboutin wedding shoes. They got special attention from me and I loved outcome. Her wedding dress was beautiful and stylish. Made specially for her by Kavelle. Lots of nice details and went really well together with her flowers. Flowers were made by very talented florists at Planet Flowers Later you will also see AWESOME room decorations at the Masnfield Traquair centre wedding venue. It was just magical. Perfect for Harry Potter theme, we just needed owls. Just gorgeous. Cake table was provided by Mimi’s Bakehouse and in the background Bleeker was singing very catchy tunes. It felt like a real party. Everyone had a pair of skite sunglasses and mood to rock the party. John sent her nice card. It had a nice little mouse drawing with 11 toes, but that is different story all together :) Loved this little touch. Girls had a great morning and everything was going nice on time. Later during the ceremony even Father Duffy said that he was surprised that Tracy was on time :) Make up was done by Nikki Weston. You can find her on FB. This was the second time I worked with her. Love her easy going attitude :) Head dress was made by Janet from Rene Walrus. My second photographer Kirsty spent morning with boys. They kicked off at Golf Tavern with few beers and posing with golf clubs. Loved John’s little detail with stag. Never seen one of these before. Wedding ceremony was at St Cuthbert’s RC Church. Father Duffy have a good sense of humour :) Guys had a good laugh. It was a bit tricky to decide what to do after the ceremony. Guys wanted to go for photos somewhere in the city, but we all know how crazy is to do something on Hogmany night. Traffic is mad and you can’t park anywhere in city centre. We planned to go to the Calton Hill, but turned out that it was pretty much closed as it was in middle of setting up for fireworks. We took our chances and still went for it. We moved fast and had lots of fun. I think guys did well and our little pre wedding experience helped them a lot. I loved Tracy’s little winter coat. It was made by very talented Mette from Freja Designer Dressmaking. I normally don’t get to hear speeches, but OMG these were one of the best speeches I have heard. Best man Mikey! He was singing his speech over Frozen tune and everyone just burst of laugh. He was definite highlight :) Loved how John braved and showed his a little bit more soft side as well, by making very nice and emotional speech. I think these photos will say all of it. Soul Inferno was providing evening entertainment and kept dance floor busy. Really great band and definitely would recommend it. Will be on my recommended suppliers list soon. Plus we took few more nice evening shots to highlight beautiful venue. We finished off evening by having few fun photos at the photo booth and went for few more moody shots around venue.Last photo of the night had to be a good hug in photo booth :) Thank you guys for being such a great friends and I look forward to document your family in future.